nothing to change or improve. 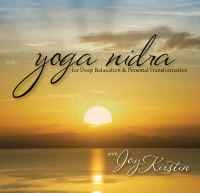 Yoga Nidra is a research-based deep relaxation practice incorporating meditative inquiry. It has been clincally tested and proven effective in helping to reduce anxiety, depression, chronic pain, insomnia. It can be practiced in the comfort of your own home or bed with a CD. Yoga Nidra practice helps to dissolve the tensions we all carry internally at the muscular, mental and emotional levels. In yoga, these tensions are called “samskaras”. They are rooted in the subconscious mind and have formed in response to various stresses, worries, traumas and life events. They are like psychic scar tissue—once formed, they shape behaviors and experiences in subtle ways, and can be difficult to release because the thinking mind’s landscape is shaped by their presence. By entering a state of total relaxation with an intention to remain alert, you can train yourself to reach a deep state of awareness that enables the psyche to gently release these tensions. Here’s a simple example to try to explain: Imagine seeing a photo of a strawberry on your computer screen. As soon as you see it, you have a response, or a series of responses—some of which you are not aware of. You may feel hungry, or you may be reminded of a childhood memory of picking strawberries, or you may feel slightly uneasy if you are allergic, etc. At the conscious level, your experience of that computer image of the strawberry is nothing more than your experience of your own mental, emotional and sensory responses to the image. But if you could view the same computer image of the straw berry at its core level (the sequence of zeros and ones that make up the binary code of the image as it is stored in the computer) you would be able to experience and observe it in a very different way, without the usual responses flooding the mind and body with their associations and accompanying sensations. At this level, your thinking mind doesn’t recognize the image or react to it in the same way. During Yoga Nidra, you have the opportunity to witness yourself from a deep level where the emotional associations don’t have the same power as they do in a waking or dreaming state. As you observe your responses, they relax their hold and release some of the tension that created them in the first place. Now, if this doesn’t make complete sense, don’t worry about it! It’s very difficult to describe how it works in a way the thinking mind can understand, and the value of the practice is in your own experience of the personal transformations you witness over time, in your experience of ease and calm in the midst of everyday moments. A “sankalpa” (Sanskrit for “resolve”) is a deeply felt intention based on a heart’s desire. Ideally, the Sankalpa is something that you are very committed to having happen, even if you don’t know how to bring it about. The Sankalpa is more than an ordinary goal, and is visited at the beginning and end of the Yoga Nidra practice. The Yoga Nidra practice relaxes the body and mind, helping to gently dissolve learned patterns of tension, and allowing a deep heart’s desire to manifest with greater ease. 1) Choose a Sankalpa. It should be something you deeply desire in your life, something that if it were already true, would contribute to you living a more fulfilling life. Over time, you’ll know if you have a true Sankalpa if it continues to feel right to use, is easy to remember, and continues to inspire you until you see it manifest. 2) Phrase it in the positive (say what you want; do not say what you don’t want or are hoping to avoid). State it as if it is already true (present or past tense), and keep the wording simple. 3) Choose a desire that at least 51% of you believes is possible to achieve within the next 6-18 months. If your Sankalpa idea is “bigger” than that, you may consider choosing something that will help pave the way for what you really want. Use your Sankalpa until it has manifested in your life. 4) Your Sankalpa may go through some changes when you first start using it. Use the Sankalpa time in the practice to keep connecting with what is trying to find expression. Stay open, and the right intention and wording will find you. 5) Using a Sankalpa is optional—the practice has many benefits even without one. Alternately, you can allow a spontaneous, heartfelt desire to arise each time you practice. This is a powerful practice on its own, indicating to your unconscious mind that you are willing and able to pause and listen to what’s important. Over time, a specific Sankalpa often begins to emerge.